Apollonia and Artemonas in Sifnos. Apollonia, the capital of Sifnos, almost in the centre of the island, about 5 kilometres from the port at Kamares. Thanks to its central location, Apollonia is a good starting point for exploring the rest of the island. Around Apollonia is five other villages so close together that it is difficult to see any clear border between them. The five other villages is Exambela, Kato Petali, Ano Petali, Katavati and Artemonas. 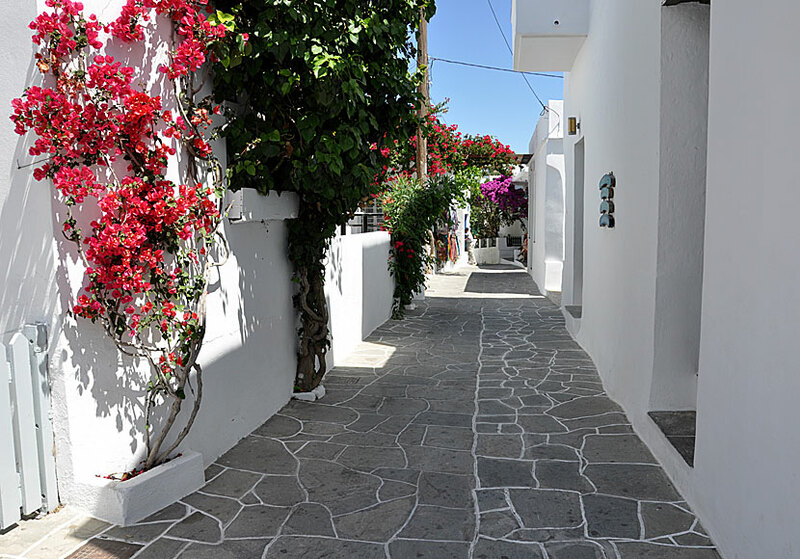 The nicest is Artemonas with its narrow alleys and beautiful holiday houses. The distances between the villages are short and to walk between them is both pleasant and interesting. From above, for example from Agios Andreas, the area looks like if a giant has passed by and dropped his popcorn bowl. The main street of Apollonia. The alley to the left of the small park at the square leads into a confused tangled of narrow alleys lined with whitewashed houses whose doors and windows are painted in all kind of colours. The blue colour do not dominate in Apollonia, it is almost as common with green or gray. Some have even gone a step further and use striking pastel colours. In almost all Greek villages there is one dominant main street, or main alley might be a better word. Apollonia is no exception. 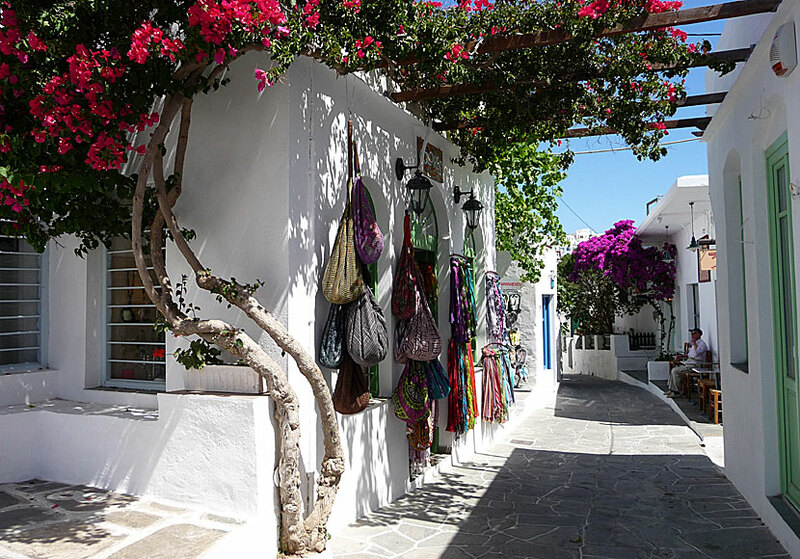 It is here that Apollonia show to advantage, along the narrow pedestrian street lies ceramics- and jewellery shops, art galleries, cafes, bars, ouzeries and tavernas. To Koutouki, one of many good restaurants in Apollonia. 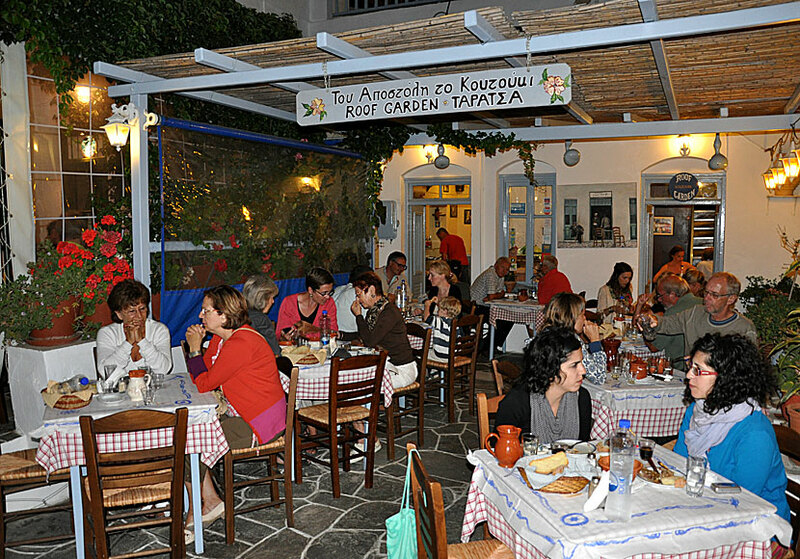 In my opinion, the best restaurant in the village is To Koutouki a short way up in the alley next to a church. The name is written in Greek, look for a round brown sign with clay pots and you will find the place. Food served in clay pot is their specials and it tastes delicious, the food melts in your mouth, it is really well-cooked. The restaurant is very popular so get there early or book a table. On a small square, further up in the alley, is an old-fashioned kafenión where one can enjoy a frappé or an ouzo and think about times long past when there were no tourists on Sifnos. In the café, the old men still are seated playing cards and discuss over a cup of Greek coffee. Further up the alley is the elegant cathedral of Agios Spiridon. A more magnificent church entrance is hard to find. One of the alleys of Apollonia. Sure it's beautiful with all the flowers! There are a lot of accommodation in Apollonia and Artemonas. 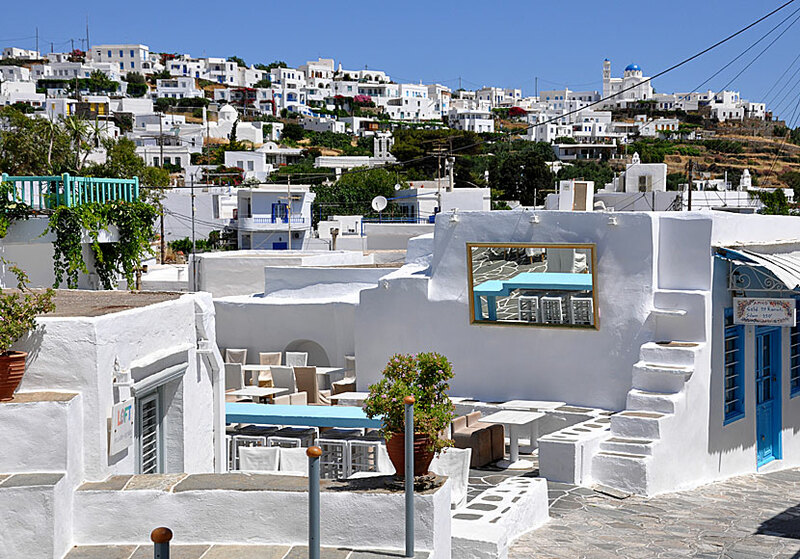 The advantage of staying here, is that it is close to the Greek everyday life, and that you stay in the middle of the island and therefore are close to most things. Distances are short on Sifnos. If you want to live centrally in the village, Anthousa fits perfectly, if you want to stay a little more luxurious, and with the pool, Gerofinika's is a good choice.